Daily and periodic day and night service. We can help with the flooding so you don't have to worry. Professional mold removal service by certified mold experts. Get your carpets clean! We can help you out. We are a HUBZone Certified Small Business that provides commercial cleaning services throughout the state of Hawaii. Whether you're responsible for an office building, retail complex, or a large multi-building industrial facility, our experienced cleaning crews & supervisors will be right at home taking care of all your janitorial maintenance needs. In addition to providing daily janitorial services in over 1 million square feet of building, our periodic crews strip & wax floors, shampoo & steam clean carpets, and do all those periodic cleaning tasks that will get your facilities fresh and new again. As an 18 year member of the Hawaii Employers Council, our Human Resource staff is up to date with all the latest applicant screening and due diligence procedures, so you can be sure we are staffing your facility with competent & trustworthy personnel. The continuous training & development of our management & supervisory personnel are just a few of the ways we attract and keep high quality leaders to service all your needs. Please visit our Happy Customers page to view several of our references. We have provided names and phone numbers of both current and past customers that we really want you to speak with. We are certainly not perfect and we're not ashamed to admit that, but I am sure all our customers will agree that when something isn’t right we will be certain to get it corrected quickly and courteously. 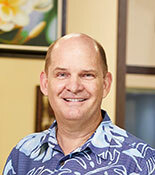 Since 1993, I have provided janitorial cleaning services in commercial buildings throughout the state of Hawaii. Starting with just a handful of buildings in 1993, I am proud to say that today our 170 employees provide professional cleaning services at over 340 buildings in Hawaii. We are fully committed to see that our employees are happy and well cared for because we know that happy employees beget happy customers. So whether you are looking for a cleaning service for your building or a great place to work, you’ve come to the right place and we are looking forward to meeting you."